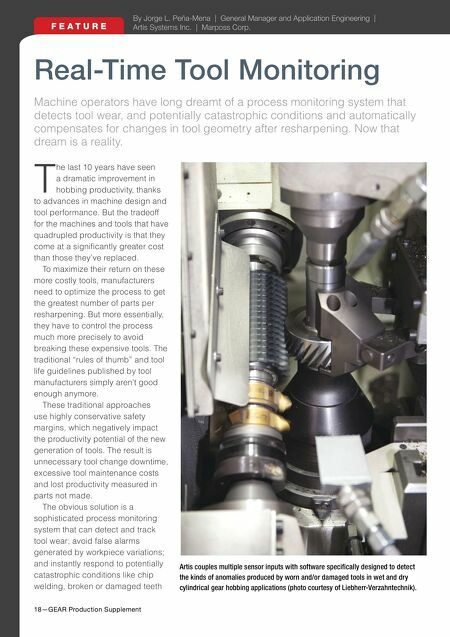 18—GEAR Production Supplement F E A T U R E By Jorge L. Peña-Mena | General Manager and Application Engineering | Artis Systems Inc. | Marposs Corp. Real-Time Tool Monitoring Machine operators have long dreamt of a process monitoring system that detects tool wear, and potentially catastrophic conditions and automatically compensates for changes in tool geometry after resharpening. Now that dream is a reality. T he last 10 years have seen a dramatic improvement in hobbing productivity, thanks to advances in machine design and tool performance. But the tradeoff for the machines and tools that have quadrupled productivity is that they come at a signifcantly greater cost than those they've replaced. To maximize their return on these more costly tools, manufacturers need to optimize the process to get the greatest number of parts per resharpening. But more essentially, they have to control the process much more precisely to avoid breaking these expensive tools. The traditional "rules of thumb" and tool life guidelines published by tool manufacturers simply aren't good enough anymore. These traditional approaches use highly conservative safety margins, which negatively impact the productivity potential of the new generation of tools. The result is unnecessary tool change downtime, excessive tool maintenance costs and lost productivity measured in parts not made. 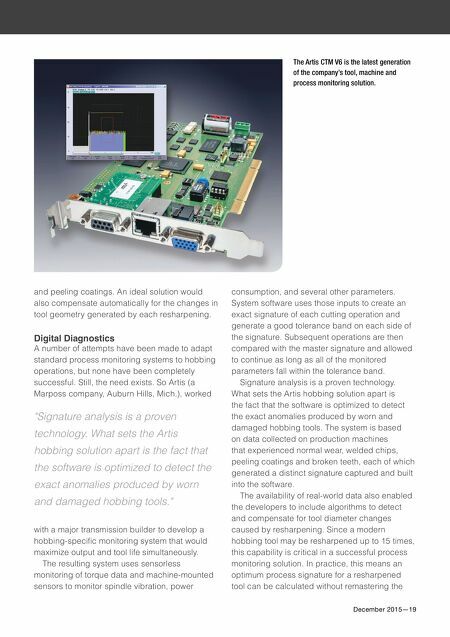 The obvious solution is a sophisticated process monitoring system that can detect and track tool wear; avoid false alarms generated by workpiece variations; and instantly respond to potentially catastrophic conditions like chip welding, broken or damaged teeth Artis couples multiple sensor inputs with software specifcally designed to detect the kinds of anomalies produced by worn and/or damaged tools in wet and dry cylindrical gear hobbing applications (photo courtesy of Liebherr-Verzahntechnik).